This was actually our New Year’s Eve treat. I fancied making it for ages and it looked so rich, creamy and decadent that it only seemed right I made it when we really had something to celebrate. My intuition was right. This is such a decadent, extravagant cake. It is lush and creamy, full of chocolate and cream cheese and about 10000000000 calories. But every single one is worth it. Omnomnom. Not that difficult to make, can feed lots of people because a small slice is very filling. Good for parties. Originally from the ever wonderful BBC Good Food website. 2 tbsp malt or Horlicks powder. You can buy little sachets that work well. 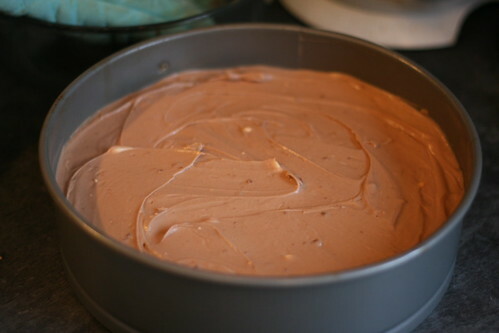 You need to get a loose-bottomed round tin for this, preferably one of the ones that has a clip on the side to pull it in tighter when the cake mix goes in and then loosens off when you take it out. Start by smashing the hell out of the biscuits. Keep them in a packet and bash them with a rolling pin, then put them in a bowl and mash them again with the end of the rolling pin and/or a tablespoon. They need to look like crumbs. 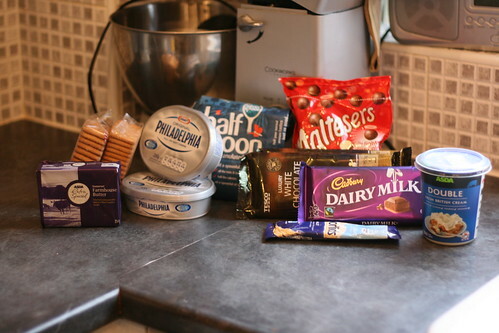 Then melt the butter and mix it in with the biscuits, as well as two tablespoons of the caster sugar. When it’s all evenly mixed in, press it into the bottom of your greased cake tin and leave it to chill whilst you make the chocolate layers. Melt the milk chocolate, either in a dish above a pan of boiling water or in the microwave, and mix in the three remaining tablespoons of sugar and the malt. Mix the chocolate mixture in with half of the cream cheese and half of the cream. 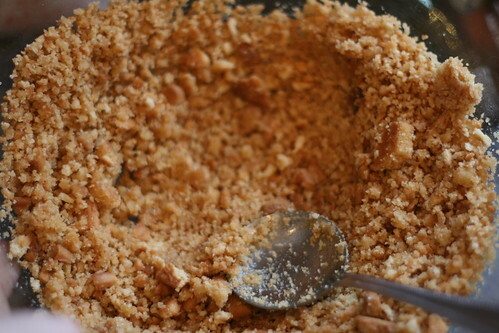 Beat it with an electric whisk until it’s thick and smooth, before spreading it over the top of the biscuits. 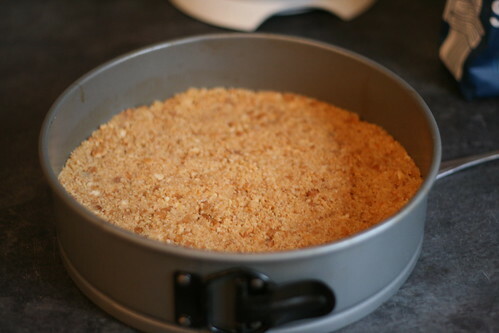 Take a clean finger and wipe around the inside of the cake tin so that you get a nice, smooth edge. 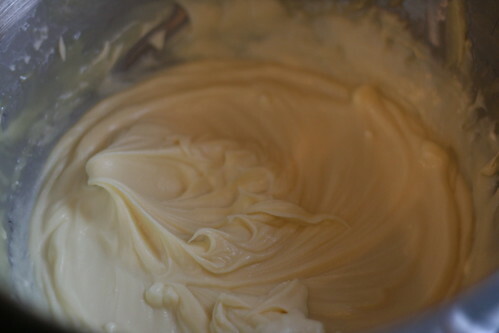 Then melt the white chocolate, mix it in with the remaining cream cheese and cream and whisk it again til it’s nice and thick. Then just smooth than on top too. 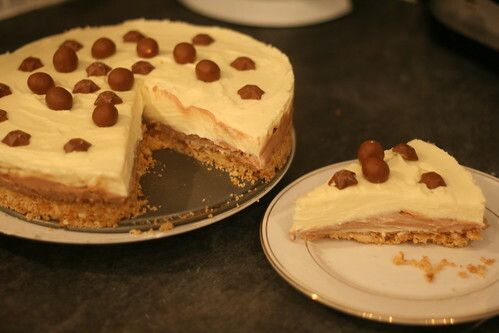 Add your Maltesers on top — I have no artistic ability so it looked rubbish, but I did add some magic stars — and chill for at least five hours. When it’s ready to be taken out just ease it carefully out of the tin (this is where having a tin that goes looser is useful) and serve. It’s so creamy, lush and delicious. And very rich. It lasted days because no-one could eat more than a sliver at a time. So yummy. There are photos here if you’d like to see some more. Sorry this has been a bit of a “dry” recipe but there were no problems or anything — it’s such an easy recipe!